Biography of J Robert Oppenheimer (1904 – 1967) - Robolab Technologies Pvt. Ltd.
J Robert Oppenheimer was an American theoretical physicist and professor of physics at the University of California, Berkeley. He was born in New York on April 22, 1904. His parents, Julius S. Oppenheimer, a wealthy German textile merchant, and Ella Friedman, an artist, were of Jewish descent but did not observe the religious traditions. He was fond of collecting rock samples since his childhood. He also liked to study microorganisms with a homemade microscope. Painting and music were his forte. His parents were well-to-do German-Jewish immigrants who had made fortune by importing textiles in New York City. They paid proper attention to their son’s needs and admitted him to the best school. When he was 12, chemistry attracted his attention. His father encouraged him by setting up a small laboratory at home and by engaging a good tutor for him. After clearing his school grade with a first class first, he traveled to Europe with his father. Here, he was exposed to various religions and cultures. During this period he also gained command over Greek, Spanish, French, Italian and Latin languages. Returning from Europe, 19 year old Oppenheimer entered Harvard University and completed his course in three years instead of the usual four and graduated with a first class. At 22, he joined the Cavendish Laboratory, Cambridge University. Here, he got an opportunity to work with Rutherford, who had contributed immensely towards the study of radioactivity and nuclear physics. He was working on the immense energy produced by the fission of the nucleus of an atom. Oppenheimer also came in contact with the great physicist Max Born and Paul Dirac. On Born’s advice and invitation, Oppenheimer decided to go to Gottingen University, Germany to work under the great mathematician. Both worked together to master mathematics and produced important research papers on quantum theories. Oppenheimer completed his doctorate there. He then moved to Zurich and worked there for some time. In Europe, Oppenheimer studied under Werner Heisenberg also. In 1928, he returned to America, a successful 24-year old young man. In America, he worked as professor at California University at Berkeley and the California Institute of Technology. He got married and settled there. He concentrated totally on academics. Besides, he worked on atomic fission. He taught advance physics and mathematics to the students. His reputation attracted students and scientists from various countries. In association with a colleague Mellah Phillips, he put forward the Oppenheimer-Philips Theory. The theory was the base for the discovery of heavy hydrogen nucleus. World War II began in 1939. Einstein and other scientists had understood the aim of Nazi Germany. They had apprised President Roosevelt about the possibility of German and Italian scientists working towards making of an atom bomb. Such a bomb could destroy the world and establish Nazi rule over the world. They felt that it was necessary for America to make such a bomb and end the World War II. The Manhattan Project, a secret mission to build an atom bomb, was launched in 1942. Oppenheimer was appointed to head the entire project, as he was the head of the Manhattan Committee. Los Alamos in New Mexico was choosen as the place for producing the atom bomb. The top-secret project began with the best scientific minds getting to act together. The group of scientists included Enrico Fermi, Neils Bohr, Hans Bethe, Arthur Compton, Von Neumann and many others. President Roosevelt had earmarked $ 2 billion for the project. The work on chain reaction was carried out at Chicago University. About 75000 miners were busy extracting uranium at Oakridge, Tennessee. Oppenheimer was to look into every aspect of this confidential project. July 16, 1945 was set for the test day of the atom bomb. A 32 ton 100 feet steel tower was erected on Gyro Hill and the bomb placed on it. At 5.30 pm from a control room 14.5 km away in the desert, a remote control button was pressed. The project head Oppenheimer and all the scientists were present at the site. As the button was pressed, a gigantic fireball rose up to 7 miles in the sky and an ear-splitting blast was heard. It was heard 450 miles away in Amarillo. Texas. The 100 feet steel tower melted away and the sand in that area was converted into green glass. All life in a radius of 1.5 km had been totally destroyed. These things happened due to the immense energy produced by the atom bomb. The scientists were satisfied with the result. Their aim was to put an end to World was II. Keeping the larger picture of the people in mind, the test was kept a secret, as it was not advisable to publish the news at that stage. On August 6, 1945, American aircraft dropped atom bombs on Hiroshima and later on August 9, 1945 on Nagasaki in Japan. The destruction was unimaginable, but at same time, it forced Japan to surrender immediately, putting an end to World War II. When the war ended, Oppenheimer appealed to the government to use atomic energy only for the betterment of society. In 1947, Oppenheimer was appointed director of the Institute for advanced study at Princeton. New Jersey and became Albert Einstein’s successor. On Oppenheimer’s recommendation, President Kennedy announced the $ 50000 ‘Atomic Energy Commission Award’ in 1963. The award was later renamed ‘Enrico Fermi Award’ to immortalize the great scientist. This award is given every year to a deserving scientist. 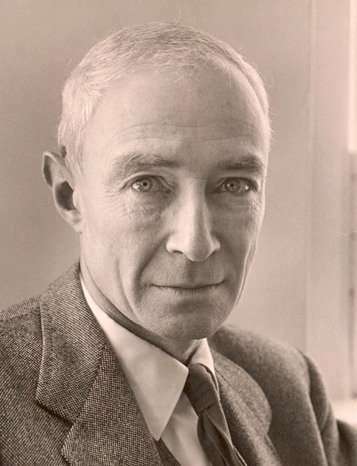 Oppenheimer died due to throat cancer on February 18, 1967. He never regretted his association with the Manhattan Project. He believed that whatever he did was to help his nation win over Hitler and the Nazis. Thereafter, he always insisted on the peaceful use of atomic energy to help make the world a better place. Today, the world remembers him as the father of the first atomic bomb, who completed this project successfully within a short span of three years.